Indy Metro Woman intrigued me the first time I picked it up. It is filled with QUALITY information and Referrals. I read it cover to cover each month. Since Options Internal Medicine has been advertising and running articles in the magazine I have been very impressed with the number of new patients who have found out about my practice through Indy Metro Woman. Mark and Karen Caprino-Burg are a pleasure to work with and helpful at every level of development. A perfect Gem of a magazine. “Indiana Orthopedic Hospital started advertising with IMW in September 2008. We were interested in this publication because it caters to our target audience. We also have a female CEO and loved the idea that we could put her on the cover. Working with IMW has been great. They are very easy to work with as well as professional and are great with reminders about upcoming deadlines. We wanted to let you know what a great pleasure it has been to get to know you and Karen and to advertise with you for our first Indy Health Expo. We were thrilled with the response that we received from Indy Metro Woman. When we placed the ad we were thinking primarily of attracting consumers to attend the show. However, what we did not anticipate was the high number of your clients and others reading the publication that contacted us and ultimately purchased a booth at our event. As you know we sold print advertising for over ten years and we know what it takes to be successful in that business. Your sincere interest in understanding our business objectives and going the extra mile to help us to succeed is much appreciated. 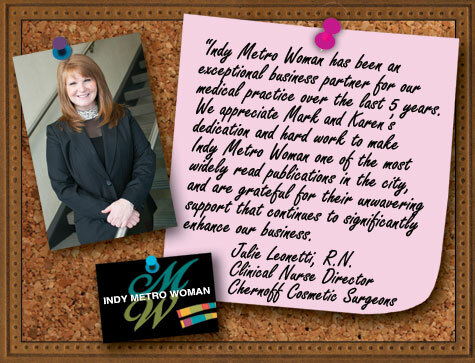 We are always reevaluating our advertising budget but there will always be a place for Indy Metro Woman. "I have written my column and promoted my services in the Indianapolis Metro Women Magazine and Indy Kids’ Directory since it's inception. I would advertise nowhere else! It is so easy to do business with the Mark Burg as he makes my needs A focus in all that they do. I receive many referrals from my placement in the magazine and appreciate the large scope of people who view this magazine. This is really an inexpensive way to get your name and services out there for the community to view!" “My business has been phenomenal since advertising in Indy Metro Woman. Mark and Karen are outstanding to work with and have impeccable customer service. They take the time to understand your business to ensure that you are successful with their publication." We enjoy working with Mark Caprino-Burg and couldn’t be more pleased with the results of our advertising efforts with Indy Metro Women. Clinical research is very fluid and unpredictable and Mark has always been flexible and accommodating. He has great ideas and knows his target audience. We have never been disappointed with our response to our recruiting efforts with IMW and would recommend them to anyone looking for quality, cost-effective advertising.